I regret to inform you that I am not a people person. This is why 6:30 AM is my favorite part of the day. No people then. Just me, a laptop, some hot coffee and silver daylight peeking out behind some bare trees. It is 30 minutes of hope, before the permission slips you forgot to sign and the emails from bosses with “great ideas” start rolling in. But eventually people start coming down the stairs, in footed pajamas, sleep still pressed into their tiny, angry cheeks, and they start asking about something to eat. Usually this involves some bacon and the shake of a Cheerios box. But lately I have craved something better, something heartier or at least something made by me. I know you think this blog is about dinner, but start thinking about breakfast, and making ChezSuzanne's My Favorite Granola with Dried Fruit. The thing about this recipe is that it is not asking you to be overly virtuous, or to go camping. It offers a deep molasses goodness, paired with the kiss of some tangy, rather than arduous dried fruit. It is great in plain yogurt, or shoveled into your face by the handfuls. However, do NOT add it to a non-fat, sugared up yogurt that food producers, with their patronizing view of your fat needs, may have forced upon your store. It will make your breakfast suddenly horribly cloying. Further, missing dried cherries, I did enjoy cranberries instead. I did not use vegetable oil but rather a nice young olive oil. These sound like major adjustments when lined up here, but they really are in the exact same spirit and it was delicious. The next time, I used rolled oats, per foodpickle, and bought some new cardamom. The oats clumped a bit less but I have to say were not as superior as one might think to the quick cooking ones. The cardamom does bring a whole chai-latte vibe to the whole matter. So use either spice, depending on which flavor you prefer. If you don’t have sunflower seeds, just use more pumpkin. Finally, you should follow her cooking directions carefully, stirring the mix once it is in the oven as she instructs. I set the microwave timer for ten minutes, so I would not forget, because I am prone to getting into long cell phone conversations concerning Mike Huckabee’s chances in Iowa or the last episode of “Modern Family.” Yes, I burn things. At each interval, I would manhandle it all a little, watching with glee as the brown sugar did that IT’S ALIVE dance that it seems to always do when warm. After my three, ten-minute stirs, I left it in for another 5 minutes, just for good measure. This is between you and your oven. I have since gone back to food52 and realized that there are a ton of granola recipes here. I can’t wait to plow through the lot of them. But they have a high bar with this dandy treat. 1. Preheat the oven to 250F. In a large mixing bowl, combine all the dry ingredients except the dried fruit and mix well with your hands. 2. In a small bowl, mix the honey, molasses and vegetable oil together until well combined. Add to the dry mixture and mix well with your hands until everything is well coated with the honey-molasses-oil mixture. 3. Spread evenly in a baking sheet and bake for 30-35 minutes. It's important to stir the mixture every 8-10 minutes pulling all the mixture from the edges and corners into the middle of the baking sheet and re-spreading the mixture. You might also want to rotate the cookie sheet after each stirring. 4. It's done when the mixture starts to darken a shade or two and you can smell the spices in the mixture. Remove from the oven and immediately fold in the dried fruit. Keep folding for a minute so that the dried fruit is warmed by the mixture. 5. Let dry until crispy and store in sealed baggies or jars. Lots of yogurt complaints here- sure enough, folks, make your own- it is surprisingly easy & has many variations in thicknesses, flavors, sweet or non-sweet. I just bought a little old Euro-Cuisine yogurt maker & followed their directions! I find it fun to make, also. Wow! I thought I had a fave recipe (from Alton Brown) but this rocks! The cardamom and molasses intrigued me; I also have a child who eats completely around the nuts in my regular granola! My tweaks were: coconut oil in place of vegetable oil (I was low on olive oil), all sunflower seeds, flax seeds in place of wheat germ, and for the fruit I used apricots, cherries, and cranberries that had been soaking in amaretto & almond extract since New Year's (left over from a pannetone recipe). The batch was small enough for testing, but since it lasted about 12 hours, next time I will quadruple it. Sometimes I stir heavy cream into my Fage yogurt if I can't get the full fat version. Why doesn't my Publix carry it? WF usually does, thank goodness! Thanks puresugar!! I'm glad the granola worked so well for you and I love your tweaks, especially using flax seed and the amaretto / almond extract maceration! GREAT ideas! I love Susan's granola. She is allergic to nuts so the extra dried fruits make you forget about them. I am a lover of nuts, so I use all kinds, but my favorite is walnuts. The olive oil is a great addition. I have my own recipe on this site and have been making it for my husband's breakfast for a couple of years. I think granola is just an excuse to have the closest thing to a oatmeal cookie as you can to start the day! Thanks so much Mary! I wish so much that I could make your granola - it just looks wonderful! And I totally agree on the oatmeal cookie angle. I've got about 6 jars of the stuff right now and want to try some in drbabs Break Your New Year's Resolution cookies. Check out whole milk yogurt from Blue Ridge Dairy Farm, sold at the Dupont Circle Farmer's Market on Sundays and some WF markets, including Tenley (http://www.brdairy.com/locations.html). Early morning solitude is up there with solo movie-going as a keeper of maternal sanity. Oh, our secret lives! Also, kudos for this masterful phrase and its evocative perfection: "... sleep still pressed into their tiny, angry cheeks..." !!! Wow. Just made this and it is really great! I added a little coconut and some almonds and used raisins and currants. I really like the cardamom, I never would have tried that without this recipe. Thanks Jestei and ChezSuzanne for this! Oh, I'm so glad you like it monkeymom!! I love the idea of coconut! my son brought home a granola recipe and we've been planning on making some this week--thanks for the great recipe and reminder! ours calls for apple sauce--will that make it mushy? i can't imagine that doing well in the oven but can the real cooks weigh in pls? Since this was my first stab at making granola, I did a bit of research and ran across applesauce as a potential ingredient. Supposedly everything (surprisingly to me) stays crisp, but the applesauce helps clumping. So if you like clumps, applesauce is a great way to go. I would love to hear how it goes with the applesauce recipe! I might add that next time around on this one to check it out. My son insisted on his recipe, since it was the 'official' school recipe. It called for applesauce and rice syrup instead of molasses. It also had 5 cups of rolled oats--I added flax and unsweetened coconut. After an hour of baking, it was really mushy, and I had the 'I should've used chezSuzanne's recipe' moment but after letting it cool, it was nice and crispy and really tasty. It had barely any clumps (which is what I like). For a first time granola maker, I was pleasantly surprised but will insist on this cardamom recipe as our next granola project! to add re: clumping--I like clumping--but the applesauce didn't help with the clumping. What is it that makes it clump? It seemed to be missing in mine. And BTW, I used to insist on only whole milk Fage, but lately the 0% Fage has been just as good for me. But I think I made the switch because the TJ and neighborhood market started to only carry the whole milk Fage in the individual containers with honey. Thanks for the feedback on the applesauce, edamame2003. It was a surprise to me to read that applesauce would help with the clumping and wondered if came for the added moistness during baking?? I'm going to try my recipe with the applesauce when I'm out of granola (I made 6 jars of it last time and have 3 jars left now) and see if it affects clumping for me. Now I'm very curious about this! I, too, hate nonfat sweetened yogurt, but I have developed an additional pet peeve - thickeners. I eat my full fat plain yogurt sans thickeners with strawberries and homemade granola. Hazelnuts and cashews are great in the granola as well. I cook mine until it is quite toasted (almost burnt) and let it cool before adding the dried fruit. It stays crunchier that way. i wish i didn't just read this. i am sitting at my desk. there is no good yogurt for miles. must. have. This is exactly the kind of kick start my morning routine has been missing. Yum, I can't wait to try it. What a great recipe, ChezSuzanne, with thanks to Jenny for highlighting it! i am sure you will come up with great local additions! Thanks so much gingerroot. I'd love hear what you think if you try it! And I'd love to hear your twist on it with ingredients!! Happy Monday! I love this recipe--so glad you showcased it. Do you have a Trader Joe's near you? They always have whole milk Fage yogurt and their store brand regular plain yogurt is also available full-fat. Have a great week. xoxo from a fellow morning introvert. Thanks so much drbabs! I'm trying my current batch of granola in your Resolution cookies next! This looks fantastic; such an incredible photo! Oh yum. Doing that next. Unsweetened tho or it would be over sweet me thinks. I've made this many times, often changing the mix of fruit and nuts depending on what I had on hand. I love the pumpkin seeds, but ever since I substituted pecans one cold December morn the week after a Thanksgiving pie baking marathon, my husband refuses to consider pumpkin or sesame seeds. And to be honest, it is awfully good. I've also added shredded coconut, preferably unsweetened, along with the dried fruit and that was good as well. That's the great thing about this recipe. So long as you don't stray from the spirit of it, tinkering with it to suit your tastes or your pantry rarely results in anything but YUM! BTW, could not agree with you more about the yogurt thing! I live in NYC and cannot get anything but fat free or low fat (usually artificially sweetened (YUK!) yogurt without taking the subway or bus to another neighborhood where I can get Stoneyfield farms or a greek style yogurt. It seems to me that if they carried a little less processed cheese food there might be a bit of shelf space available for regular old whole milk yogurt. so glad you love this recipe too. and i must say even the stoneyfield i see at WF is low fat. Thanks so much for your comments, cookingalong! I'm so glad you've enjoyed this granola too. And I like how adaptable it is too! I started making homemade granola last year and never looked back. Change it up nearly every time so happy to see this recipe. And, I'm totally with you on the non-fat yogurt charade w/their "patronizing view of your fat needs" - amen to that. Finally, mad props for the junior mints recipe. Huge hit - barely had any left by game time. Thank you! homemade yogurt next recipe? glad you loved those junior mints. they are a big hit chez nous. 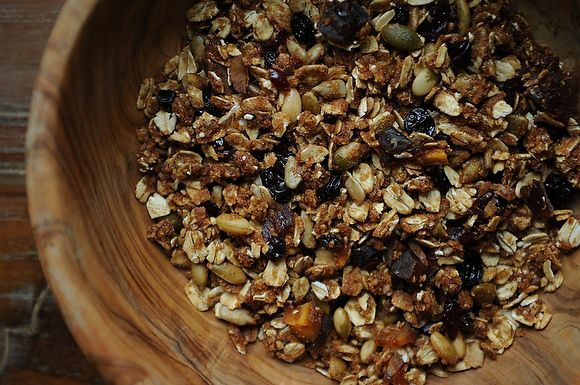 Thanks so much Jenny for showcasing my granola recipe!! What an incredibly wonderful surprise to wake up to this morning. I'm glad you like it, and yes, as you point out, it's not your virtuous granola, and I can live with that :-). Thanks for your thoughts on substitutions too! I can't wait to cook more of your wonderful recipes. Thanks so much Jenny. I just can't tell you how honored I am by your selecting one of my recipes to write about. Such a highlight for me. This has nothing to do with granola, but I recently discovered Modern Family & have rarely laughed so hard. Weekday breakfast is also important! I make granola often and like to mix it up w/flax and sesame seeds in similar proportions to this delish-looking recipe. I worried the flax seed taste would overwhelm, but in the company of all the other toasted goodness, it doesn't. I have never made a batch with this mix of spices, or molasses, so thanks, Jenny and ChezSuzanne, for the inspiration! A tip (from smittenkitchen) for keeping your granola crunchy: store in the freezer. I had no idea about the freezing idea! Thanks for the tip!